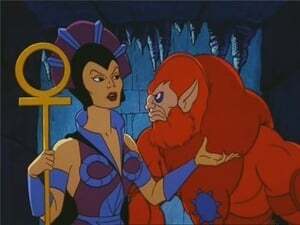 While entertaining the Royal Family with his magic, Orko finds his act interrupted by a strange sorceress called Majestra. Majestra performs a trick in which she appears to make the King vanish then reappear- but in fact, Majestra is really Evil-Lyn in disguise, and has teleported the King to the dungeon and replaced him with a disguised Beast Man! Evil-Lyn has found a magical Shaping Staff which can transform anything into whatever the holder wishes- and under their disguises, Evil-Lyn and Beast Man set about causing havoc around the palace, turning each member of the Royal Family into helpless animals, while Skeletor awaits them at Grayskull with his latest creation- an evil version of He-Man, called Faker!